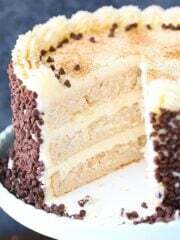 This Cannoli Layer Cake is a light, moist cinnamon cake filled with a mascarpone and ricotta filling, then frosted with mascarpone frosting. 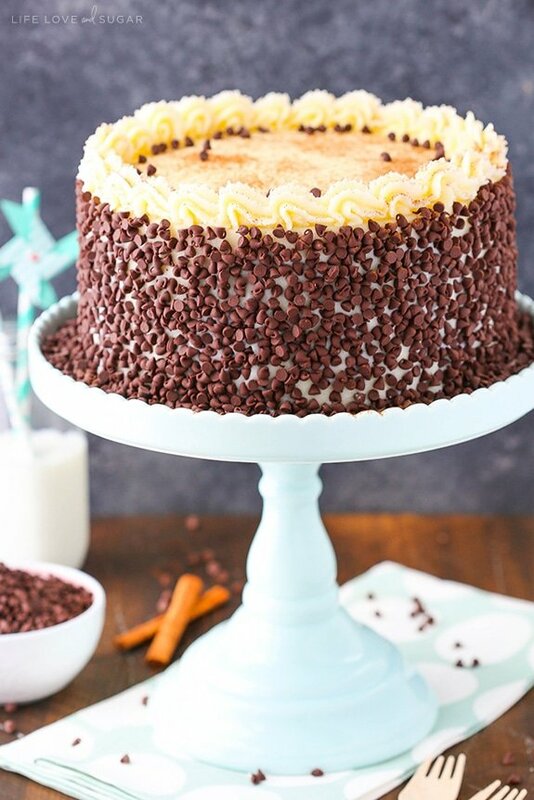 It’s covered in mini chocolate chips for a treat that has all the best parts of a cannoli in one delicious cake! I’ve got several piles of clothing that haven’t been worn in years and the same for shoes. I’m even going through the kitchen cabinets. These days I have so much baking equipment that I’m running out of space. Things are piling up and it’s like towers of pans fall over every time I need to get one thing out. It’s time to remove the things I don’t use to make space for all the things I do. I’m pretty pumped to get everything out of the house and donate it to someone who can use it. And this cake is so darn delicious. 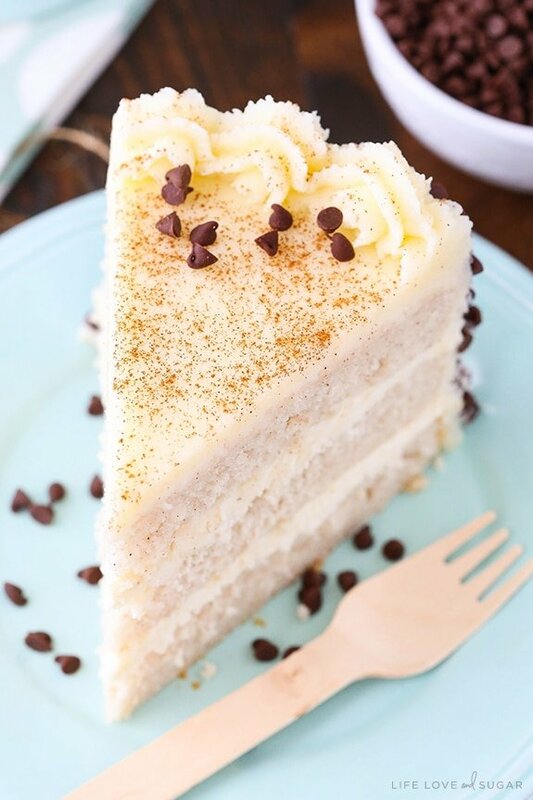 Cannoli as a flavor for cakes and such always surprises me. It seems like a flavor that’s so light and primarily composed of a little cinnamon and a couple kinds of cheese would be fairly boring – and yet every cannoli dessert I make I totally fall in love with. They are anything but boring. 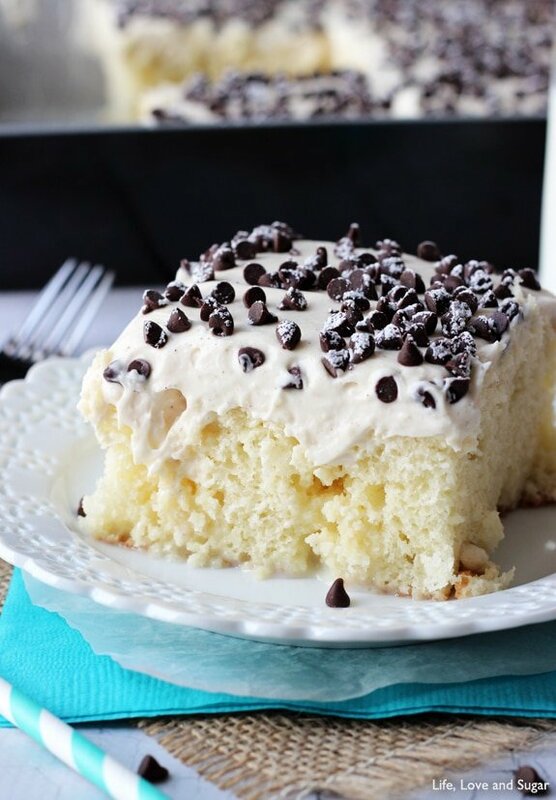 Mascarpone cheese has easily become one of my favorite things to use in desserts. The flavor is incredibly light, but so darn good and just sweet enough. The one thing you have to be careful of when using mascarpone cheese is that you don’t want to over mix it or mix it at a high speed. The lowest speed you have is best. It easily gets watery if you aren’t careful. Because the filling and frosting for this cake are made with ricotta and mascarpone cheeses, you’ll need to pay careful attention to the process of building the cake. You’ll want to have the cheeses at room temperature when you mix them so that they incorporate easily without being lumpy, but you’ll want to leave time to set them in the fridge to firm back up before layering and frosting the cake. There’s a bit of waiting involved at a couple points to make sure things are firm, since the cheeses aren’t naturally firm at room temperature. If you use a ricotta cheese that’s fairly watery, you may want to strain it before using. If you would prefer not to use ricotta, you could also replace it with additional mascarpone cheese. As far as flow goes with putting the cake together, I made the filling first and let it firm up while the cakes cooled after baking. Once things are ready you want to be fairly quick about building the cake and adding the filling layers, since the filling can soften again if it sits out for too long. Once it’s all layered, I used any remaining filling to add a crumb coat, then refrigerated the cake until the filling was nice and firm, about 2-3 hours. Once firm, you’ll use the frosting to cover the cake. Again, you’ll want to work relatively quickly so things don’t soften too much. While I usually use a fair number of steps to make a nice, smooth cake, I just used my offset spatula to frost this one. The mascarpone frosting is quite sticky, so it’d be much harder to use my usual paper towel and such to smooth it. 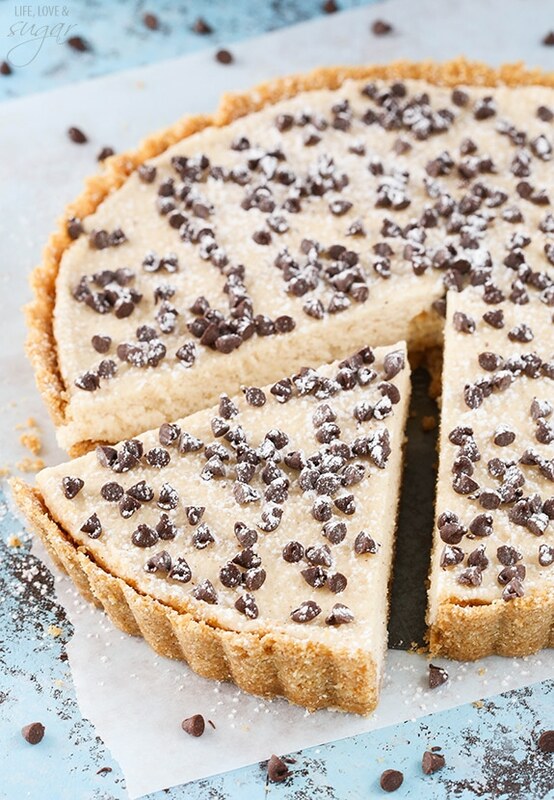 Plus, since the chocolate chips are added to the sides, there’s really no need to get it perfect. To finish of the cake, press mini chocolate chips into the sides and add a little border. I also sprinkled on a little cinnamon, but that’s totally optional. 8. Remove the cakes from the oven and allow to cool for about 3-5 minutes, then remove to cooling racks to cool completely. 9. While the cakes cool, make the filling. To make the filling, add all the ingredients to a mixer bowl and mix on low speed until well combined. Do not overmix or mix on a high speed or the mascarpone cheese will become thin and watery. If you are using a ricotta cheese that is watery, you may want to strain it first. 10. Place the filling in the fridge to firm up a bit, about 2-3 hours. 11. When the cakes are cool and the filling is ready, build the cake. First, remove the domes from the tops of the cake layers with a large serrated knife. 12. Place the first layer of cake on a cake circle or serving stand, then spread about 1 1/2 cups of filling on top. It should have firmed up in the fridge, but might still be a bit soft, so work relatively quickly. 13. Repeat with the next layer of cake and filling, then top the cake with the final layer of cake. 14. Use any remaining filling to quickly add a crumb coat to the cake, then place the cake in the fridge to firm up, 2-3 hours. If you have a large cake carrier to store it in, that’s best. 15. While the cake firms up, make the frosting. To make the frosting, add all the ingredients to a mixer bowl and mix on low speed until well combined. Do not overmix or mix on a high speed or the mascarpone cheese will become thin and watery. 16. Place the frosting in the fridge to firm up a bit, about 2-3 hours. 17. When the cake and frosting are ready, frost the outside of the cake. I used my offset spatula to get a nice, even layer. Keep aside about 1/2 – 3/4 cup of frosting for the border. 18. 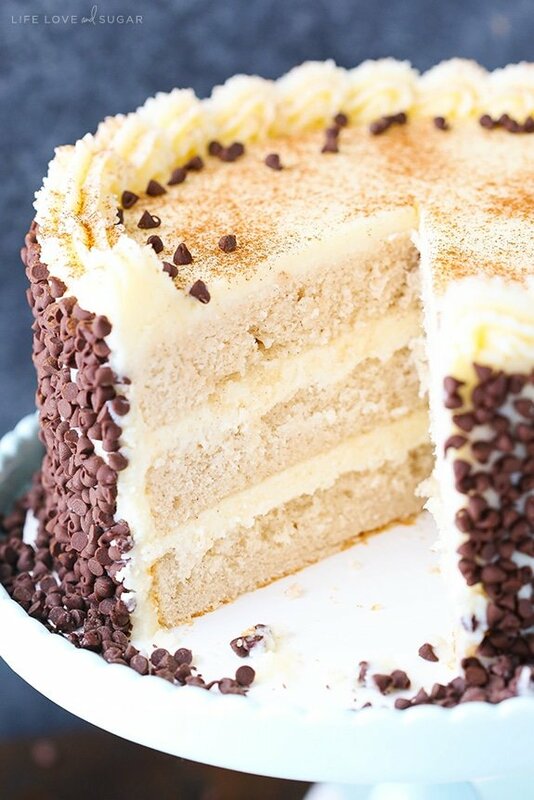 Press the mini chocolate chips onto the sides of the cake. 19. Pipe a border around the top edge of the cake. I used Ateco tip 844, but Wilton 2D or 1M would work as well. 20. Refrigerate cake until ready to serve. * Room temperature is relative, as some people’s homes are warmer than others. Mascarpone cheese is quite sensitive to heat. You want it to still be a bit chilled, but not too cold or firm. I often take it out of the fridge about 15 minutes before I need it to take some of the chill off of it, but still have it cool. Mascarpone cheese, if it gets too warm, will get too soft and doesn’t do well at firming back up. This cake is incredible. Of course. The gorgeous level here is so high. And the flavor…wow. My husband and I have been talking about downsizing lately. It’s a few years away but I dread the day I have to pack my kitchen – way too many pans but I can’t seem to get rid of any of them! This cake is stunning and delicious I’m sure. 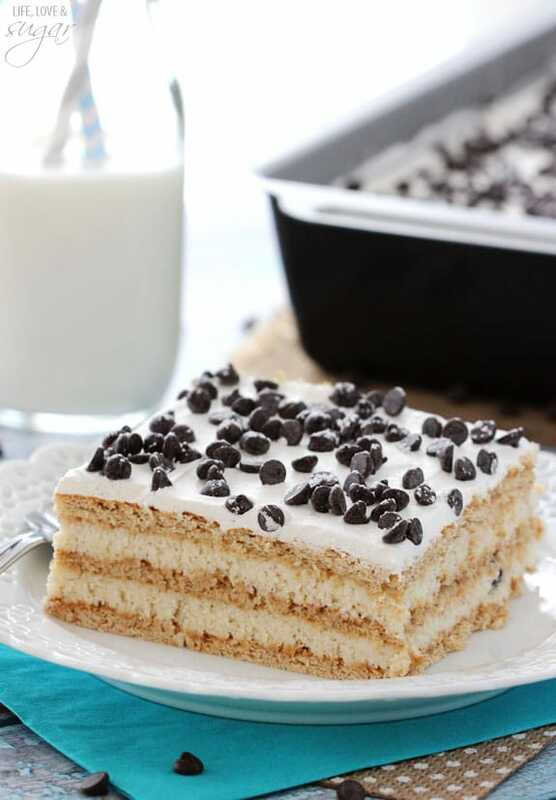 I didn’t have much luck with your Cannoli Poke Cake (probably beat the cheese too much). It was delicious but the icing was a little runny and it was definitely not as pretty as yours. Love your recipes, photography, blog and I’m really looking forward to your cookbook! I wouldn’t say that I have a trick. I cup some in my hand (mostly in my fingers), start at the bottom and press them into the sides. My family would love this! 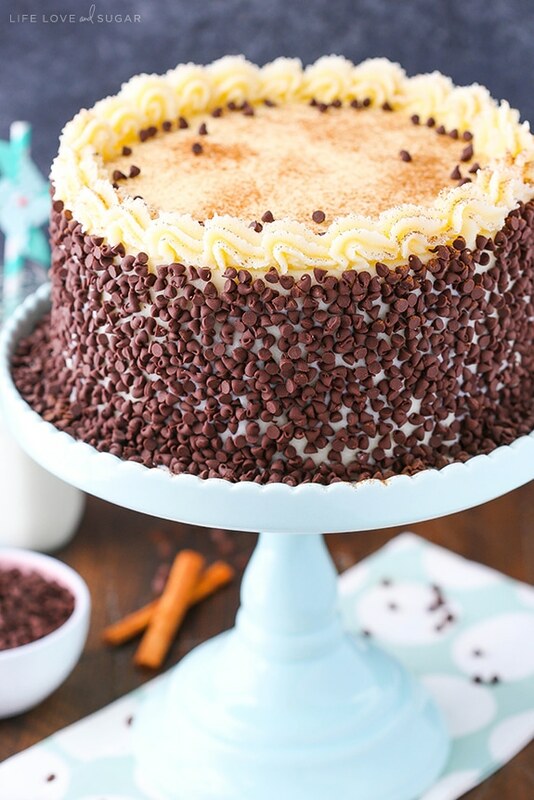 We all love cannoli, I never thought of a cannoli cake! It is so beautiful too! 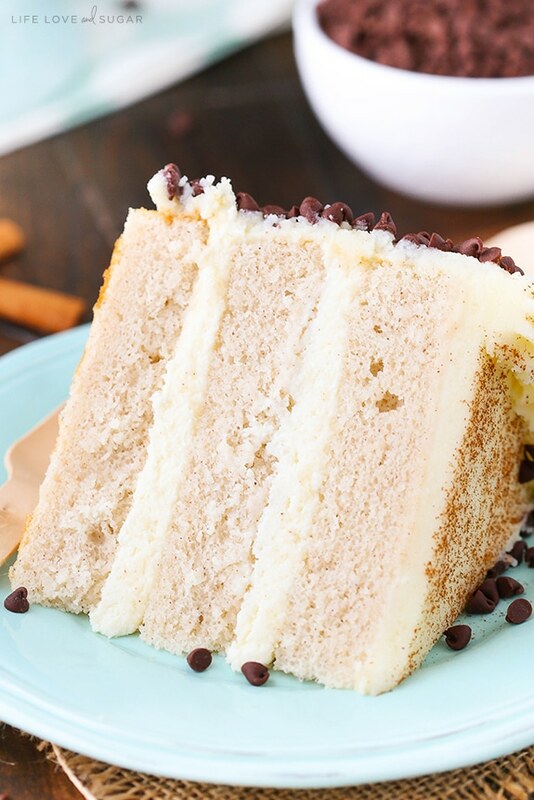 I LOVE anything Cannoli and can’t wait to try this cake! It’s just beautiful!!! I’m crazy for cannoli so any one of these recipes would be heaven. Thanks so much for new ways to get the taste. made your cake for our family’s July August birthday get together. It was a total success. That’s wonderful! I’m so glad it was a hit! Your pictures and cakes are awesome! Can’t wait to make some of them. BTW,what lens are you using? Thank you! I wrote about the lenses I use here. Typically I use a 100mm. 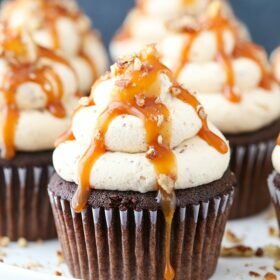 Could I do the filling and frosting the nite before and refrigerate for the next day to fill and frost? I’m interested in making this cake. I was wondering if the cake layers are moist. Thanks! Yes, they are very moist and fluffy. Do you whip the egg whites before incorporating in to the batter? I made this cake for my family this past Easter Sunday! What a HUGE hit! Moist, so tasty and not too sweet. Perfection! Keep these recipes coming…everyone I’ve recreated has been incredible. I’m so glad you’ve enjoyed everything! Thanks Sara! I just did my very first wedding cake for my niece’s wedding. Someone who was at the reception asked me if I would do one for her daughter in law’s baby shower. She wants a three tiered cake. Her favorite is a cannoli cake. Do you think this cake could stand up if properly supported with dowels? The cake layers themselves would be ok, but the mascarpone frosting might not do so well sitting out for a while at a wedding. If you are planning on keeping it refrigerated until serving, it might be ok. But I’d try it out and see what you think first. How far in advance could I make this? Do you think it would it hold up ok for 2 days prior to eating? That should be fine, if refrigerated. Do you think the filling and frosting will still taste as good with a marble cake? Hmmm, it’d be a little different flavors, but might be ok. I have not worked with ricotta in baking before so not sure how to tell if it is considered watery. Is it best to just be safe and strain overnight? Often ones that are watery have actual water pooling in the container when you open them. Definitely the best way to be safe would be to strain it, if you’re unsure. I hope you’re feeling well and looking forward to the holidays. I’m so thrilled for you and your husband???? 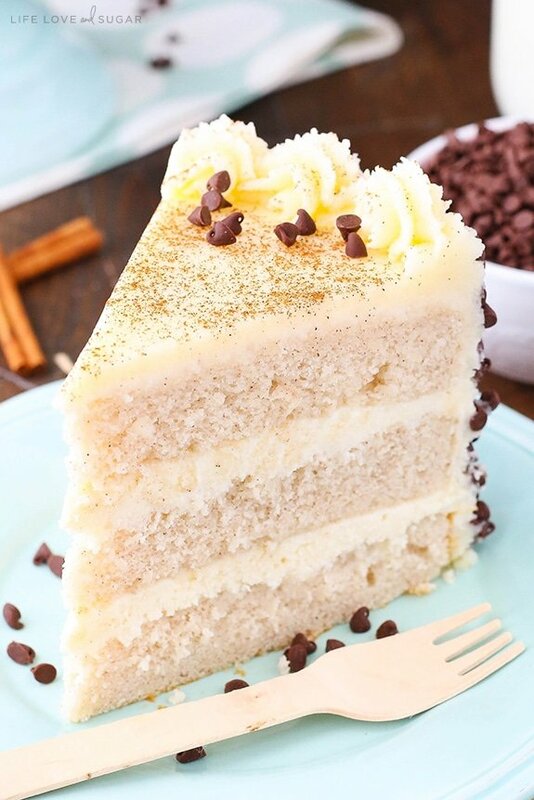 Have you ever added rum to this cake? My twins want a cannoli cake for their birthday (and so do I!! ), but I’m just wondering if a little rum would work with this recipe, Brooklyn style ???? Thanks Michelle! I haven’t done it, but it sounds delicious. 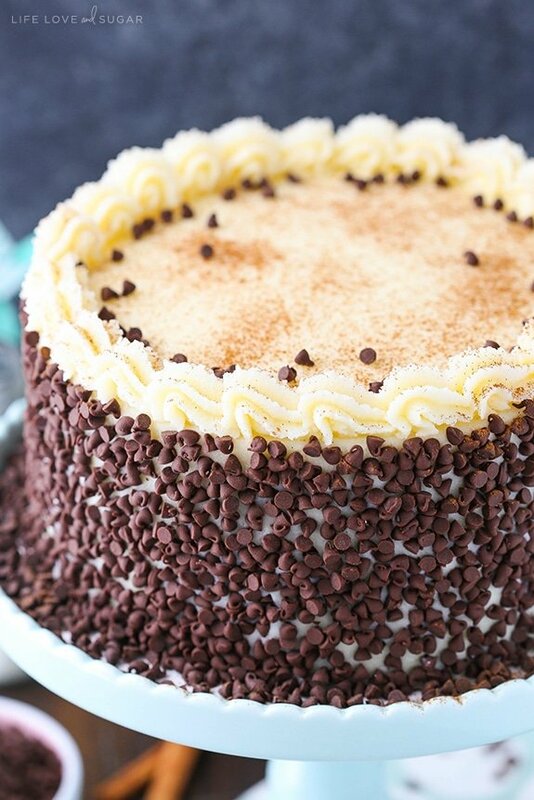 You could replace some or all of the water in the cake with the rum. 🙂 Happy Thanksgiving! This is the most amazing dessert I’ve ever made! It was a huge hit at Easter with my in-laws. Thank you so much for this recipe!!! Awesome to hear that! Thanks Alex! I made this cake today and I plan on making it again for my sons birthday party next weekend. I have a question about the frosting. I left my mascarpone cheese out to get to room temperature and I mixed it slowly with the powdered sugar and vanilla extract but it didn’t seem to come together smoothly. I was afraid to overmix as it said in your instructions. Do you know about how long you mixed it for? After refrigerating, when I went to frost the cake it was kind of just dropping off. Any tips would be great. I’m sorry you had that experience. I’ve added a note to the recipe about the mascarpone cheese. It’s pretty sensitive to heat and if it gets too warm, it’ll get too soft and it doesn’t really firm back up well. So like, you don’t want it sitting on the counter for too long before using, especially if you keep your home a little warmer. You want to cheese to still have a bit of a chill on it. If you didn’t over mix it, it sounds like it could have been a temperature issue. I’m sorry! I made this as a cake and LOVED it! Such a good recipe. Could this be turned into cupcakes? Or do you not think this recipe would bake well this way? So glad you enjoyed it! 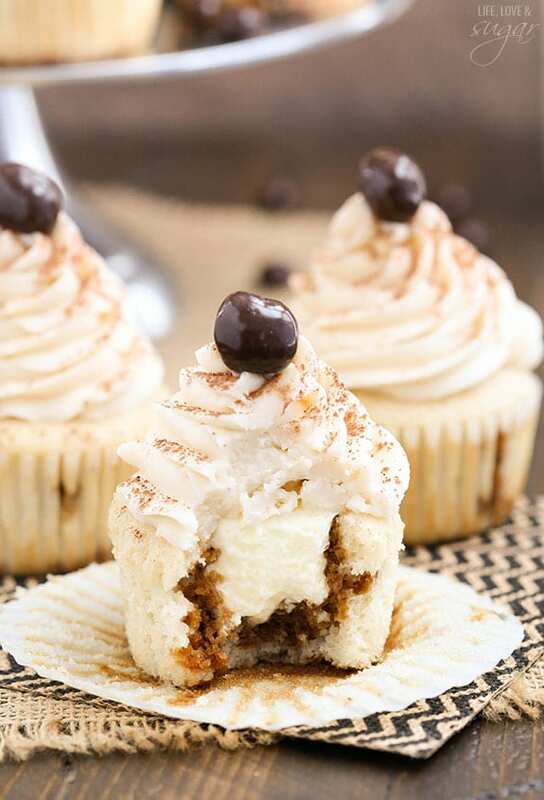 And yes, it could be made as cupcakes. They should be roughly 1 1/2 inches in height. Are you sure you fully creamed the butter and sugar? Do you think this would work as a 9×13 cake? It should be fine. 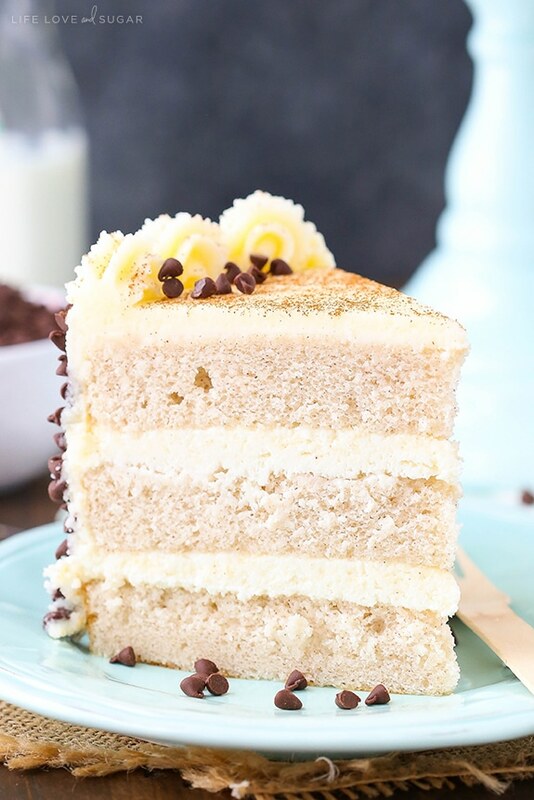 I also have this version of a Cannoli Poke Cake. I’m so sad every time I look at one of your recipes and it doesn’t have a video 🙁 I know you have your hands full though! 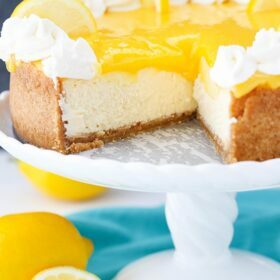 I absolutely adore your recipes, they’re incredible! Yes, most of my older recipes don’t have videos, sadly. Maybe one day I’ll be able to go back to them all. I’m so glad you enjoy the recipes! Yes, I think it’d work well. The one listed for the cake will have a stronger mascarpone flavor to it, but the other one should be nice too. Delish! Everyone liked the cake at our holiday party and it was a looker on the table too! I especially liked the chocolate chips and might put some in the filling next time. Thanks for another great recipe.